Polenta is coarsely or finely ground yellow or white cornmeal boiled with water, milk or broth into a smooth porridge. Try this creamy and flavorful polenta recipe as an alternative to mashed potatoes or rice when you plan your next dinner menu; makes 3 to 4 servings. In a medium saucepan over medium-high heat, bring the milk, broth, butter or margarine and salt to a brief boil (keep an eye on the mixture so it does not boil over). Immediately reduce the heat to medium-low and gradually and vigorously whisk in the corn meal. Reduce the heat to low, cover and cook for 20 minutes, lifting the lid and stirring every 3 or 4 minutes to prevent sticking. Towards the last 5 minutes of cooking time, whisk in additional milk as needed to adjust the consistency. The polenta should be thick and creamy but never stiff. Stir in the pepper and parmesan. Check the seasoning and add additional salt and pepper to taste. If necessary, adjust the consistency again by adding more milk. 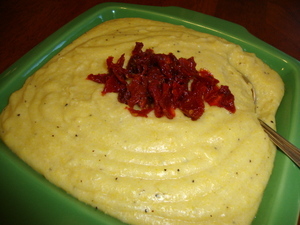 The polenta may be made up to 20 minutes ahead of time and kept covered until ready to serve. Garnish if desired and serve.